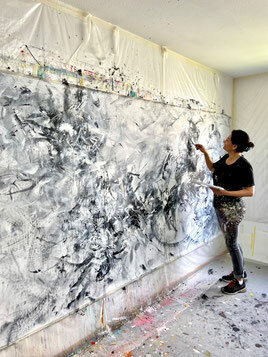 My name is Maria Bevilacqua-Fischer, I'm a Germany based professional artist born in Italy. I paint with acrylic colours, brushes and palette knifes - but essentially I paint with my heart and soul. My vision is to create and share unique and soulful paintings that convey joy, harmony and serenity. It's my pleasure being able to offer you my hand painted art – made with love – to enrich your place. If there is a need to classify my work, I would say "abstract expressionism" is the best fitting category, because all my paintings are about my feelings and emotions. But as I don't like categories and want to be free while painting, there are a few new works, which have "figurative" elements and some works of mine I would call "minimalist". Before I start painting, I take a short break from busy life, trying to stop thinking and opening to the creative inner world. When I then start painting intuitively, I let the colours and forms appear as they like… and I allow to be led from the inner perceptions and inspiration. I work with professional acrylic colours directly on gallery wrapped canvas or thin hdf-boards, which can be beautifully framed. I love vibrant, strong colors as red, orange and blue which symbolize vital energy and joy of living to me. I like strong colour contrasts, but also soft and soothing colours attract me... I adore to work in many layers to allow the colors to build different structures and textures adding other material e.g. sand, paper, litle stones,... to give the painting a 'personality' of its own. Every piece I create is original and one-of-a-kind. My wish is to convey joy, harmony and serenity through my ART - and to add a touch of uniqueness to your home or office to create an inimitable ambience: YOURS. I believe, that it is uplifting and inspiring to surround oneself with beautiful and meaningful original ART, because it keeps and conveys the colour vibrance and powerful energy saved while being created. In my opinion paintings open new spaces for fantasy and perception. It's a way of to feed the soul. Hope you draw some inspiration from my paintings… and I'm happy to hear from you!